If you do not have a computer to allocate just for automated trading 24/7 (or you do not have a reliable internet connection), you will need to run your MetaTrader software from a Virtual Private Server (VPS). A VPS is just a computer at an offsite location that runs and stays online 24/7 with a very reliable high-speed internet connection. 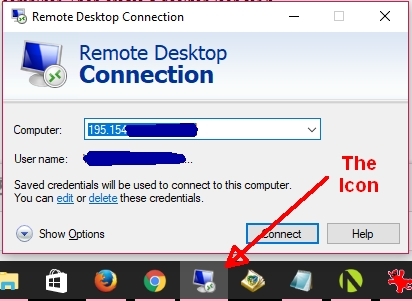 You can access your VPS from your home computer any time and use it just like you would your home computer via the Remote Desktop Connection App/program that comes standard with all Windows computers. Do a search on your computer if you can't find it or CLICK HERE for a Windows VPS login tutorial. MAC users may need to download the Microsoft Remote Desktop Connection APP. Your VPS company will provide you with an IP address, username and password to your VPS. A new VPS usually comes with very strict security settings so after logging into your VPS, open your internet browser's security settings (on your VPS) and enable downloads in the advanced security settings. You may also need to lower your overall browser security settings. This will allow you to download MT4 and your robot files onto the VPS through the web browser. Once your browser's security settings are lowered, log into your broker's website then download and install their MT4 trading platform onto your VPS. MT4 Installation Tip: If you will be running more than 1 instance of MT4 simultaneously, change the name of the MT4 program file in C:/Program Files (x86) immediately after installation. Just add a number 1 after the name like "MetaTrader-1" or "MT4-1". This will allow you to install additional instances of MT4 in the future without overwriting the original installation. Since hedging is not allowed at US forex brokers, US citizens will need to install and run a separate MT4 for each GBP/JPY robot they intend to trade so they can each run on a separate MT4 account to prevent conflicting trades. Ionos.com Virtual Cloud Servers (I use the Cloud M package) Starting at $4.99/month +$10/month for Windows OS. Before I got my Ionos VPS, I had a VPS from UltraHosting but Ionos VPS was so much faster that I dumped UltraHosting and got another Ionos VPS at a fraction of the price. I use the Cloud M package with 1 GB RAM and 50 GB storage space for $4.99/month for the first year then $9.99/month starting the 2nd year plus up to $10/month for Windows OS. The Windows fee is charged by the minute that you're logged in and maxes out at $9.99/month. I highly recommend a VPS from Ionos.com for both speed and price. YOU MUST HAVE A WINDOWS OPERATING SYSTEM ON YOUR VPS so choose the latest Windows Operating System they offer (Windows 2012 or 2016 are both fine). I now have 3 VPS from Ionos each running up to 6 MT4s simultaneously. I only noticed a slight lag after adding the 6th MT4 so it can handle a lot. After purchasing your VPS from Ionos.com, you can access your VPS login credentials under on the Ionos.com website under "Servers & Cloud" Then click the IP address to access your Username and password. The default username is "Administrator". If your VPS username is "root" then you got a Linux OS and you must contact customer support to have it changed to Windows. Vultr.com has good prices and I have done several installations for clients on their servers and they seem just as fast as 1and1.com servers. So, if 1and1 does not accept you due to your country of residence (they don't service all countries) then Vultr.com is the next best choice. BeeksFX has a good reputation and I've read good things about them but they are expensive. I tried to get a VPS at BeeksFX but I couldn't even get a reply from their customer support so that was the end of that effort, but I've included the link above so you have options. BeeksFX has servers all over the world and are known for having super fast speeds and are often used by scalpers, but that's not important with my robots since they are not scalpers and often go for big moves. It's important that you disable automatic Window's updates on your VPS, otherwise, your system will reboot after every update and will close your MT4 software. Instead, you can do manual updates on the weekends. AVOID CLOSING MT4 in the middle of a money management cycle. If you restart the MT4 platform when there are no open trades, the EA (Robot) will default to the minimum lots on the next trade when the software is restarted. For example, if your robot just had 3 winning trades and the next trade should be 4 units (and no trades are currently open during restart), then it will default back to your minimum lot setting. However, you can compensate for this by simply disabling Roulette Trader Money Management (change to False) and use the Fixed Lot setting until the next trade opens at the correcct lot size, then enable RT Money Managemement and the EA will resume the correct unit count from that point forward. Keep in mind that if you restart your MT4 during an open trade, then no adjustments are needed for the EAs that have open trades at the time of restart. Recompiling your EA: The same is true if you compile your Expert Advisor source code. After each compile, the robot will default back to the minimum lots on the next trade so do not make changes to the EA source code in the middle of a trading cycle. Instead, use the Expert Advisor Properties feature on the chart to change any settings. To do this, right click on the chart that the EA is attached to and select "Expert Advisor > Properties" from the popup window. If your EA ever gets detached from your chart and must be re-attached, check these properties settings to make sure they did not change to the defaults in the source code. Follow these steps to install more than one instance of MT4 onto a PC or VPS, and DON'T SKIP ANYTHING! The easiest way to get MT4 onto your VPS is to download the MT4 installation zip file onto your home computer. Then copy and paste the MT4 zip file onto the desktop of your VPS. Double click it to start the first installation on your VPS. It will create a "MetaTrader" folder under the folder Program Files (x86). Close MT4 when it opens automatically and delete the 2 desktop icons it creates. 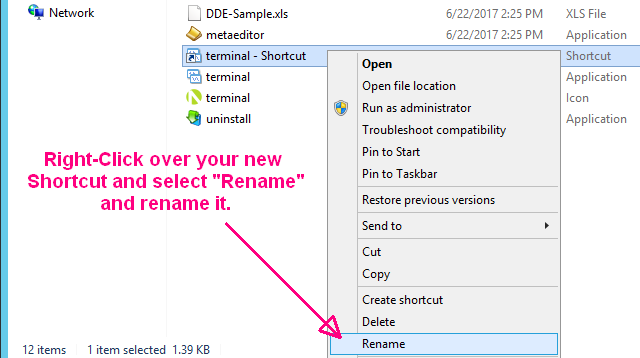 Open the MetaTrader folder in Windows Explorer under c:\This PC\Local Disk\Program Files (x86) and change the name of the MetaTrader folder to something like OANDA-1 (or the name of your broker). 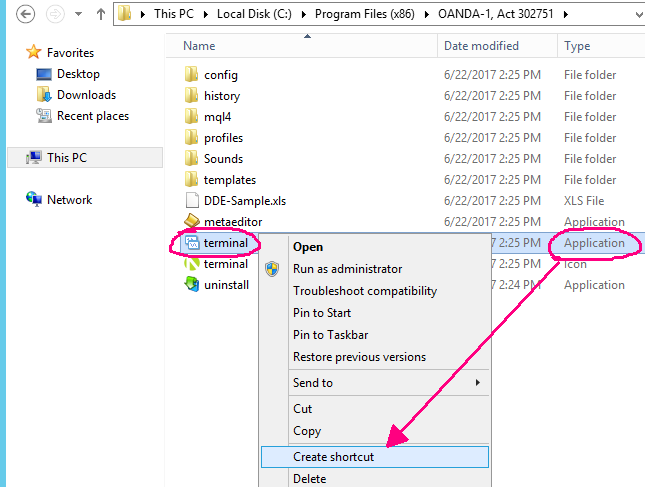 Then open the OANDA-1 folder, right-click over the Application file and choose "Create Shortcut". Double Click your newly renamed shortcut to open MT4 then copy and paste that shortcut onto your VPS Desktop. You can now open this MT4 from that shortcut on your VPS desktop. Since you changed the MetaTrader directory name, you can now install another instance of MT4 without over-writing the previous installation. Repeat the steps above for each additional instance of MT4 but give each installation a unique name like OANDA-2, OANDA-3, etc. To install the EAs, create a Roulette Trader folder on your VPS desktop. Then copy the EA files on your home computer and paste them into the Roulette Trader folder on your VPS. From there, you can copy the EA files into each separate installation of MT4. Open the Data Folder in each MT4 and you can paste the files in the appropriate folders of each one like an assembly line. In the MT4 Navigator that displays the Experts folder on the left side of MT4, right-click over "Experts" and choose "Refresh" so your newly installed EA files will appear. After installation and EA setup is complete, close each MT4 and reopen them from your new desktop icons. This will save your current settings and make sure MT4 recognizes all of the new files.